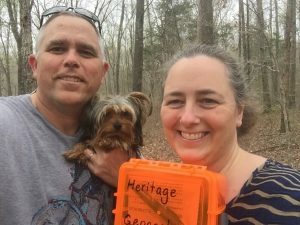 In March of 2016, the Heritage Team at Land Between the Lakes National Recreation Area launched our inaugural Heritage Geocache Challenge. Our goal was to get people out into the wood, hiking, exploring, and learning about the rich history of our area. It turned out to be a great success on all fronts. The Land Between the Lakes National Recreation Area is a United States National Recreation Area containing roughly 170,000 acres located in Western Kentucky and Tennessee between Kentucky Lake, formed by the Tennessee River, and Lake Barkley, formed by the Cumberland River. Originally designated a national recreation by President John F. Kennedy in 1963, and run by the Tennessee Valley Authority until 1998, today Land Between the Lakes is operated by the United States Forest Service. 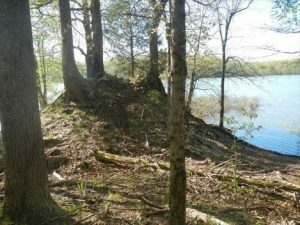 We created a pilot project to test interest and participation in a Heritage Geocache outdoor adventure at Land Between the Lakes. After quite a bit of brain-storming, we came up with five interesting locations on the landscape that offered outdoor bushwhacking adventure to historical places and learning opportunities where the public could experience some of the diverse histories of Western Kentucky and Tennessee. We placed a geocache box at each site. In each geocache box, there is a sign-in and date logbook and 100 aluminum metal tree tags stamped with numbering specific to that cache location. The idea was for each geocache participant to collect one tree tag from each of the 5 locations. 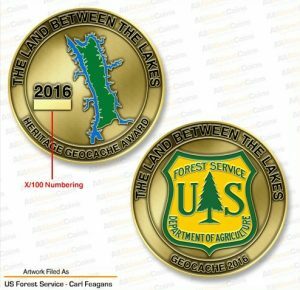 Once they had all five, they could exchange their tree tags from each geocache location at Land Between the Lakes’ Golden Pond Visitor Center for a Land Between the Lakes Heritage Geocache 2016 challenge coin created just for this event. 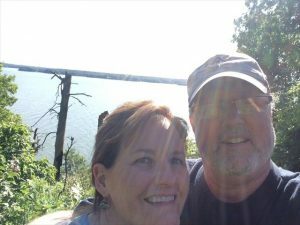 We created an account at Geocaching.com and put out a press release explaining the challenge to the public. We asked them to also register as a member with www.geocaching.com and to log their visits at each of the heritage locations. Land Between the Lakes Heritage Geocache 2016 Challenge Coin. The five heritage sites chosen for the inaugural run of the Heritage Geocache Challenge reflect the diversity of the human experience in our area of the country during the historic period. 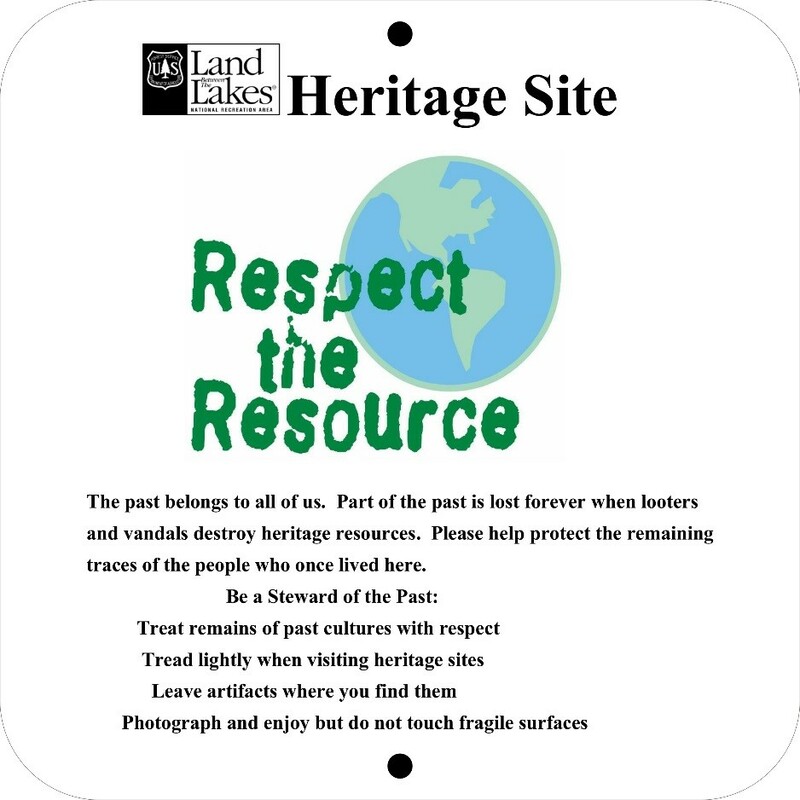 At each of the sites, we installed a “Respect the Resource” sign to remind the public to tread lightly. Fulton furnace was built in 1845 and owned by Daniel Hillman and Dr. Thomas T. Watson as part of their Empire Iron Works. In addition to Fulton, the company also operated Center Furnace, Empire Furnace, and the Tennessee Rolling Mill which they had transported piece by piece from where they purchased it in Tennessee to where they reconstructed it along the Cumberland River just two miles west of Fulton. The furnace stack was thirty-three feet high and eleven feet wide inside at the base. In a twenty-two week period in 1857, before the furnace was closed, it produced 1,044 tons of iron for the St. Louis and Lower Mississippi River markets. The trek out to the furnace involved a two mile hike out to the edge of the lake where the furnace remains rest on the shoreline. This geocache was placed in honor of Jim Baccus, a former resident who wanted the public to get out and experience the history of the area. 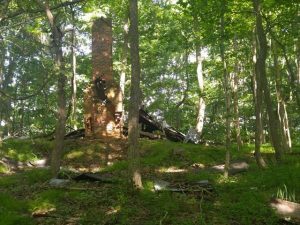 Photo of Fulton furnace remains by geocacher GEO.JOE. Governor Keen Johnson, the 45th Governor of Kentucky, was born at this location in 1896 in the Brandon Chapel Methodist Parsonage. He was the son of the Rev. Robert Johnson and Mattie Holloway Johnson. While the parsonage is long gone, the well still remains. This geocache was also placed in honor of Jim Baccus, a former resident who wanted the public to get out and experience the history of the area. Photo of the parsonage well by geocacher Superstretch3. Cedar Bluff is a high ridge overlooking Kentucky Lake located in the remains of the former Rushing Creek camping and recreation area operated by the Tennessee Valley Authority. While this section of the Rushing Creek campground was closed by the TVA before the US Forest Service took over, picnic tables, grills, and campfire rings still remain at the old campsites. Photo of view overlooking Kentucky Lake at Cedar Bluff by the geocacher KY_Hiker. The Acree Chimney site is the location of a former home-site overlooking Lake Barkley. Once owned by Lytton G. Acree, a prominent business man in the area, the early-20th Century house is now slowly dissolving back into the landscape. Averaging a 1.5 mile round-trip hike across very hilly terrain, the remote location provides hikers with an interesting look, not only at a beautiful view, but also at the production of the archaeological record. Photo of the Acree Chimney site by geocacher Tman2329. Joe Jackson was a prominent African-American in the Stewart County, Tennessee, portion of Land Between the Lakes and one of the last African Americans to live in that portion of the County. He is the only person whose name is known that is buried in Jackson Cemetery. The geocache was placed at the former location of the associated African-American church and school, both of which occupied the same building, and are now known as Joe Jackson Church and School. This geocache was placed in honor of Joe Jackson as well as Lynn and Judy Lancaster; former residents who have worked with the Heritage team to document and preserve the history of the area. Photo of the happy geocachers at the Joe Jackson Church and School location. Photo by geocacher Ranger462. The comments left by the geocachers on the geocaching.com website was one of the most rewarding aspects of this project. 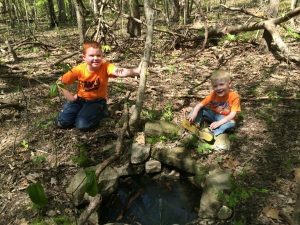 It was apparent that they enjoyed being out in the woods and learning the history of the area. This was the most difficult cache we have ever done. As two very overweight individuals, this was down right uncomfortable and intense at times, but we did it! We signed the log & left our signature bugs. Thanks for the challenge and the reminder that anything is possible! Thanks for placing these caches and highlighting some of the unique heritage sites in LBL. Can’t wait to see what the next series looks like. A great day of hiking and high adventure with Beekeeper99 as we tackled the LBL Heritage Caches and a few others in the area. The day was filled with great views, creatures of all shapes and sizes, miles of hiking and driving, and the occasional geocacher to say “hello” to. “Thank you, LBL, for setting up this series for us to hunt, enjoy, and bring us closer to the heritage of LBL”. Great journey in and out for this hide. I was glad that my GPSr had some of the terrain aspects still available as it made the hike much easier. TFTC #9035. Cool place. Loved the well. Watch that mashed down fence. Almost got me. Signed the log and took the tag. Too cool! I have camped along this road many many times and never knew this was here. As we returned to the car, there was a pair of eagles that came overhead and circles and screeched for several minutes as they apparently had a midair discussion…. (I think the wife won. lol) Now, on to the other 4 very soon,! 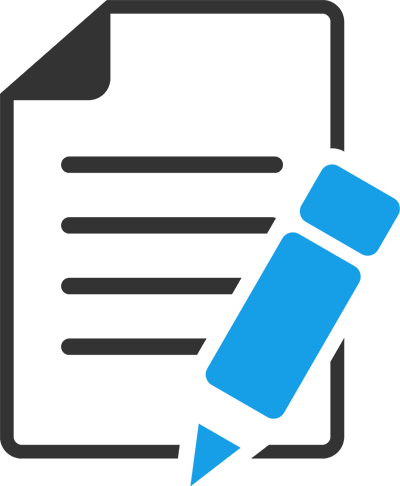 The 2016 challenge was such a rewarding success that we have decided to start planning for the 2017 challenge. For this upcoming challenge, we will offer a different selection of heritage sites. 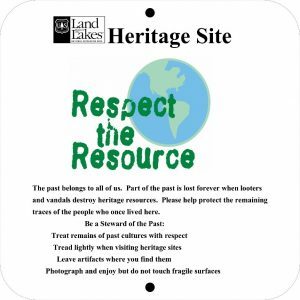 We will be working more closely with additional former residents in an attempt to include heritage locations at Land Between the Lakes that they would like to see highlighted. Hopefully, the 2017 Heritage Geocache Challenge will be just as much fun.